When Emirates (not it seems Emirates Airlines) was created in 1985 things were rather different in the Middle East. Sadam ruled in Iraq, Gaddafi in Libya and Dubai was considered something of a sleepy backwater. Gulf Air was the dominant carrier and the new airline, backed by the Emirate of the same name, was considered a flag raising upstart not to be considered seriously. Today Emirates is the largest air carrier in the Middle East, operating over 2,500 flights per week from its hub at Dubai International Airport Terminal 3, to 129 cities in 75 countries across six continents. Its current aircraft fleet consists of 197 aircraft including 31 Airbus A380s and 122 Boeing 777s, of various specifications. At least 59 A380s are still to come as are 73 of the wide-bodied Boeings, and 70 of the yet to fly A350s. Last year the airline carried 34m passengers (31 April 2011) with, in what was a difficult year for all airlines, reduced profits of US$629m against US$1.6bn, but an increased turnover. It has won numerous awards. At the Dubai Airshow 2001 Emirates astonished the airline world with an order for 22 of the speculative Airbus A3XX, later to be called the A380. This has grown to commitments for 90, part of a bid by Dubai to become the international hub of the airline world. 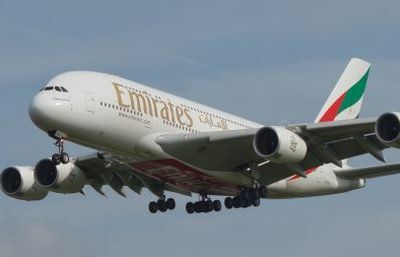 Emirates introduced the double deck Airbus in August 2008 with a non-stop service to New York. Today Emirates offers five daily A380 flights from Heathrow to Dubai plus services from Birmingham, Gatwick, Glasgow, Manchester, Newcastle and also Dublin, using A380, 777 and Airbus A330 equipment. Over 70% of passengers connect at Dubai and the overall load factor is given as 80%. Your editor was recently invited to view the new Concourse A at Dubai’s Terminal 3. There is obviously only one way to fly out and that was Emirates A380, Business Class. Depending on the fare paid a Mercedes chauffeur service is offered and if you want to play on the computer before travelling the seat allocation page is one of the best on offer. In the days prior to your departure Emirates keeps you well informed electronically of flight and terminal details, and if you are travelling light suggests printing out your boarding pass and going through Fast Track. For the future that will not even be necessary, a well charged hand held mobile device is all that is required. Don’t worry about it running out of charge, there are USB points in the lounge and at your seat on the aircraft. It may be an old terminal but T3 has been excellently modernised with good signage and the purpose-built Emirates lounge is one of the best, overlooking the apron with direct exclusive access by escalator to the aircraft. It is understated compared with the rival Qatar Airways offering in T4, but there is a fine buffet selection if you want to eat before boarding and all the facilities expected of a top class airport lounge. All in all very comfortable, easily accommodating the maximum 76 passengers. The walk from security is short through what some people might recognize as the modern version of a bazzar. On the way back Fast Track immigration is available but hardly worth bothering about. European passport holders in the main are dealt with quickly these days. Fast Track can mean mixing with international travellers who require deeper examination, and it can be slow. There are currently nine airlines with the A380 in their fleet. 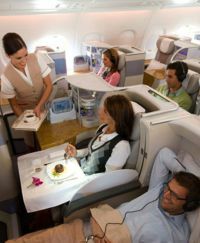 Only Emirates, Lufthansa and Thai offer First Class on the top deck. 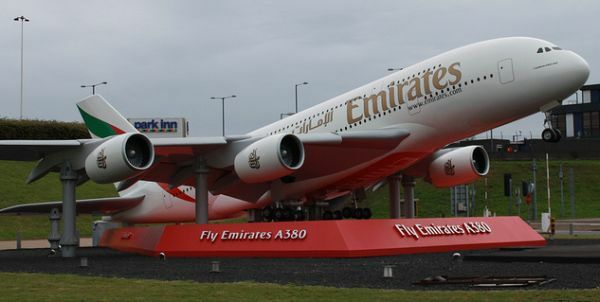 For all the A380 carriers this is where Business Class resides. The cabin is exceptionally quiet. The Business Class layout is 2+4 (1/2/1)+2 with aisle access from every seat, which is not the case with Air France and Lufthansa. The seats are slightly narrow but there is plenty of table space and also large window boxes if you are lucky enough to gain that position. No blinds but an electric button. The seat has essentially four positions, one for take-off, another for working at the table or dining, halfway (very good for sleeping), or completely flat. A mattress and blanket is provided but no sleeping suit, reserved for First Class passengers (who have a shower too). There is a mini-bar built into the seat, a novel but clearly popular facility. Electrically operated dividers are also provided. Where to be seated is often a guessing game and dictated by what is available. If you sit at the front of the aircraft it is a long walk to the loos, which are at the back, and the aisle is narrow. If you allocate yourself at the rear you can be disturbed by the bar, the largest currently available in the air, with a pair of proper couches, a fine selection of beverages, and plenty of snacks. It is very popular particularly with regulars. But it can be noisy and has the large galley directly behind. The cabin crew on the aircraft are from a variety of nationalities and offering most languages experienced on international travel. Upon boarding your coat is placed in a wardrobe and champagne, orange and water is on offer. With five flights a day, the meal service varies from a full four-course meal, to a hot breakfast. The catering conforms to halal requirements, which means no pork, but does include shellfish. If there has to be a criticism it is that the galley is a long way from the front of the aircraft and whilst the staff are extremely attentive it can take some time to attract attention, the requirement necessitating a return trip to the rear of the aircraft. One can use the phone to speak to the cabin crew (and passengers elsewhere on the aircraft – including downstairs) and I suspect regulars, once they know it exists, will use the facility. When Qantas comes on the route shortly, with the working area central, the comparison will be interesting. But no on-board lounge. And do their clients use the oneworld or Emirates facility at Heathrow? The service and dining selection on board was top quality but no flexibility regarding when the major meal was served. Vegetarian was not offered but there are plenty of options by pre-ordering online, and very easy to select. Staff were available throughout the flight and ‘light bites’ hot and cold could be had at any time. Wi-fi is provided by On-Air as is a texting service. The 17" touch screen TV offers a huge selection and there is a handy small moveable visual control unit to sort out everything you require electronically. All in all a very pleasant flight and the best A380 offering to date. Upon arrival the very new Concourse A at Dubai proved to be something of a letdown, although this will not affect the majority of passengers who are connecting through. Fast Track immigration is provided for First and Business Class passengers and this took about 20 minutes, the London night flight coinciding with services from all over Europe. The service itself was polite and as quick as possible, the sheer numbers overwhelming the system. A lane was provided for children and those with disabilities but it was the hoards of Economy passengers that one must have sympathy with. All the positions were seemingly being used but the process was clearly extremely slow, the staff having to deal with holidaymakers from the western world and also workers from India and Pakistan requiring a more thorough investigation. The airport is aware of the problem. Emirates has a separate Business Class drop-off and check-in areas which work effortlessly. More anon at a later date when we review Terminal 3.